Friday, 15 March marks the eighth anniversary of the beginning of the war in Syria. The international Catholic pastoral charity Aid to the Church in Need (ACN International) is marking the occasion (in its Spanish office) with an appeal to highlight the ongoing emergency situation in the country, and especially the plight of the 127,185 Christian families registered in Syria according to data collected by the foundation. The war in Syria has unleashed the greatest humanitarian catastrophe since the Second World War, with some 12 million refugees and internally displaced. Meanwhile, Christians in Syria now represent just 3% of the population, whereas before the war they were 10%. In addition to all the consequences of the hostilities and the economic embargo, they have also suffered religious persecution at the hands of the jihadist groups involved in the conflict. During these eight years of war, in fact, 1,707 Christians were murdered and 677 abducted. At the same time 1,309 Christian churches and other Church properties were destroyed and 7,802 Christian houses and homes damaged or destroyed. 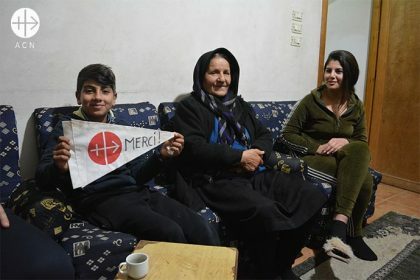 Mzaineh village, Valley of the Christians: Displaced family Granny, Johena, her daughter, Selma and grandchildren, Elian, 11, and 16-year-old Marita – all in receipt of ACN emergency help. Since the beginning of the conflict, in March 2011, and up to the end 2018, ACN has allocated 29.5 million Euros for 738 projects to fulfil its mission to support the Church in need throughout the country. The projects were implemented by 9 different Christian Churches, thanks to the cooperation of 130 project partners on the spot. Of the 738 projects funded, some 80% (23.5 million Euros) were in the form of emergency aid, among them some 308 for the basic necessities of Christian families who have not left the country. 10% of the aid has been for the reconstruction of people’s homes and Church properties. A further 6% was for the support of priests in the country, in the form of Mass stipends and pastoral aid. Haiyar Palace, one of the big houses in Homs, destroyed by the bombs. The 13 main emergency aid projects funded during these eight years of war include the following: direct emergency aid for the most basic necessities; food parcels, financial support for students, medical aid, support with rent, heating, electricity, gas and water; milk and nappies for babies and small children, essential medicines, Christmas gifts for the children, warm clothing, educational materials and vocational counselling. The project “a drop of milk” for children under 10 years, accounted for 15% of the total emergency aid given, while over 2 million Euros were given in the form of help with rent for the Christian refugee families and almost 1 million (985,991) Euros in help for the rebuilding of the houses of returning families. 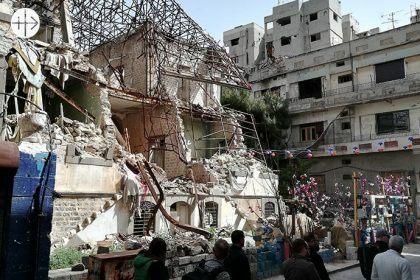 Pope Francis has never ceased to denounce the injustice of the war in Syria over the past eight years and has continued to draw attention to the suffering of the Christians. “Let us pray and let us help the Christians to remain in Syria and the Middle East as witnesses to mercy, pardon and reconciliation”, he has stated. “May the prayers of the Church help them to experience the closeness of the faithful God and touch every human conscience to seek a sincere compromise for the sake of peace. And may God our Lord pardon those who are waging war, those who manufacture arms to destroy one another, and may he convert their hearts. 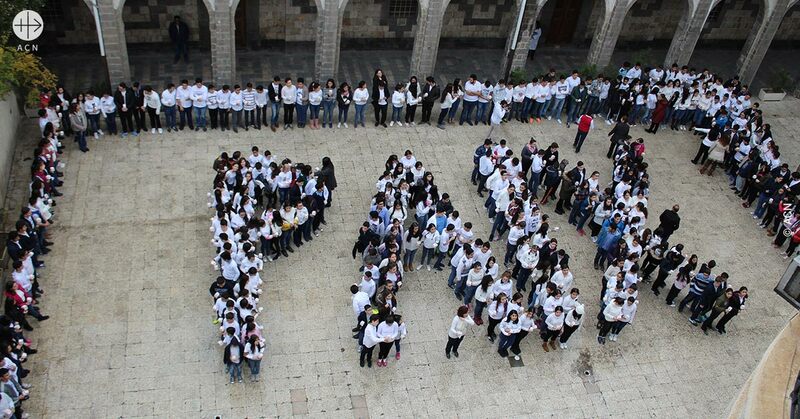 Let us pray for peace in our beloved Syria”, he concluded.